My reflections of today's events through a discussion of American History. Monday, 17 September 2012 marks the sesquicentennial of the Battle of Antietam. On this date in 1862, more American battle casualties were inflicted than on any other single day previous or since. For the first year and a half of the American Civil War, fighting had mostly consisted of raids, skirmishes by cavalry units and frantic, large-scale troop movements to counter one threat or another, usually by the Confederate forces who routinely snatched the initiative from overly cautions Union generals. During the summer of 1862, General Robert E. Lee again forced Union forces to respond to his invasion of the North. Threatening Washington, D. C. to the southeast, Lee’s Army of Northern Virginia checked any possibility of a northern march on Richmond while causing panic, including political damage to the beleaguered presidential administration. Forces otherwise available for consolidation against rebel forces were abruptly reassigned to man the defensed in and around the fractured nation’s capital. By late summer of 1862, President Abraham Lincoln remained frustrated by his army’s lack of success in closing with and defeating the enemy. Knowing that the relatively light casualties suffered so far would not buy victory, the president also faced a very real menace of diplomatic catastrophe if England formally recognized the government of the secessionist Slave States. Such active recognition would doom any attempts by the United States Navy to blockade the states in rebellion and provide the rebels with a reliable and substantial source of modern weapons, countering the material advantage then enjoyed by the North. Lincoln understood that tying support for the Confederacy to that movement’s underlying defense of slavery would prevent the cataclysmic effect of Great Britain’s recognition of the South. What he needed, though, was a victory – even the pretense of victory – to ground his ultimatum to the states in rebellion in the eyes of both Americans and those of world powers among which the United States did not yet belong. Antietam’s nearly 23,000 casualties, including over 3,500 dead, marked the weighty moment in time Lincoln and America needed. Commanding the Union IX Corps was Liberty, Indiana resident Major General Ambrose Burnside. 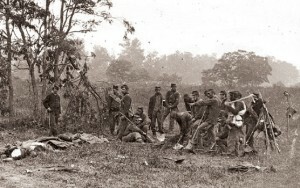 Men under Burnside’s command, (which did not include the Iron Brigade), repeatedly stormed a well defended bridge against withering Confederate fire before finally seizing the objective, though at a cost in both appalling casualties and precious time bought for the rebel forces to maneuver and withdraw from the field. Controversy remains over Burnside’s conduct during the battle with many historians offering the notion that his pre-war friend and commanding general, George B. McClellan, unjustly offered up Burnside as a scapegoat for the battle’s unrealized potential for crushing Robert E. Lee’s Army of Northern Virginia. This Saturday is the one hundred fifty year anniversary of Lincoln’s famous proclamation. 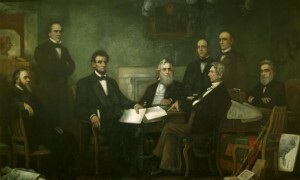 For this event I’ll add a post soliciting responses as to the present day implications of the Emancipation Proclamation, the text of which in linked here. I appreciate this work and this writer. Thanks, Steve. I’ll never hold a candle to your wonderful prose and well researched history. You have a gift for taking a major event and bringing to life the simple human perspective of a single participant. muy interesante y verdadero !